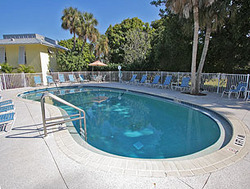 Same beautiful resort on Longboat Key, new and improved website. RVA, a ResortQuest® Affiliate, launches a new Beach Castle website with numerous new features including: online booking capability, local attraction suggestions to help our guests plan their Longboat Key vacation, a photo gallery that brings the resort to life and a special offers selection that will reward our guests while maximizing their vacation budget. Between the azure blues of the Gulf of Mexico and the Southwest Florida skies, resides Beach Castle Resort of Longboat Key. A quaint 21-unit condominium resort with classic charm, and situated on one of the narrowest parts of Longboat Key, Beach Castle offers units with a variety of views including Gulf front, bay front, garden and pool – catering to even the most discerning traveler. Equipped with spacious one-, two- and three-bedroom options, this resort offers a laid-back appeal combined with modern amenities and comfortable appointments. To inquire about Beach Castle Resort, 5310 Gulf of Mexico Drive, Longboat Key, FL 34228, call 888-655-0973. Visit our website at http://www.beachcastle.com. RVA, a ResortQuest® Affiliate, is one of the nation’s leading vacation rental companies in Southwest Florida. RVA is the largest management company of vacation condominiums, homes and resort-style properties on Florida’s west coast, based on a portfolio of over 300 units. The Southwest Florida inventory includes premier beach destinations like: Anna Maria Island, Bradenton, Longboat Key, Lido Key, Sarasota, Siesta Key and Venice.